This blog have information for those startups who have made up their mind to create an smart home app. We’ve rounded up top features of Doorport, smart home app. It will help you to understand the current market requirement for Smart Home App Development. Let’s have a look! In the 21st century where everything becomes ‘smart’ then why your home can’t be? Thanks to a few smart home companies like DoorPort, your home can also get the tag of ‘smart’ and turns into a smart home. Smart home companies like DoorPort aims some of the common problems all landlords and residents are facing to maintain the security of the property and provides the web-based solution of those problems. Smart home applications are so smart that not only the security of the house but a user can control home appliances like AC, lights, Refrigerator through his smartphone. Because of the wide variety of features and convenience, the requirement of smart home kit and a smart home app is increasing like never before. According to the Forbes magazine, 45 million smart home devices have been installed across the USA only in 2018. And if you are curious about the future of Smart home apps and companies, then the graph clearly depicts that by the year 2022, the market size of smart home technologies will be as high as $53.45 billion. After reading this astonishing details of the market size of smart home apps and companies, if you are wondering the reasons for it, then here are top reasons why the smart home industry is growing so fast. Why Smart Home Apps and Companies are Growing So Fast? Due to more civilization, the cost of some of the traditional non-reusable energy is increasing at the speed of the rocket. Because of this, people have to pay more for the electricity they are using. So, people adopt smart home technologies which make sure that there is no wastage of electricity in the house and this is how people can save a lot of money. According to an organization named Alarms, there are around 2.5 million burglaries happen in a year. So, in order to not be a victim of crimes, people want more security. But of course, traditional security like locks and intercom system can be easily breached by the suspect. Smart home security systems are more secure and more reliable. Like people are concern about the rising energy cost, the government is also concern about the same. The government knows that to minimize the consumption of energy, there should be a smart system which reduces the waste use of energy. Thus, many governments have launched so many programs to encourage people to use smart home technologies in their houses. Inspire is the California based company which provides not only a smart home app solution to the customers but provides 100% clean energy. Basically, a customer has to call the company to get the quote. After it, the company provides some of the best renewable energy kits like solar panels along with the smartphone app to control the home appliances. Because of this unique concept of providing green energy solution in a smart way, Inspire has raised $38.2 Million. Oakter is the Indian based smart home company which has been started by Varun Gupta, Nithin David and Shishir Gupta in 2014. They made a smart home kit which lets the user to control AC, geyser, Water Pump and room heater. Not only control, but the user can schedule the timing of such appliances. Additionally, the user can unlock or lock the door with the app. 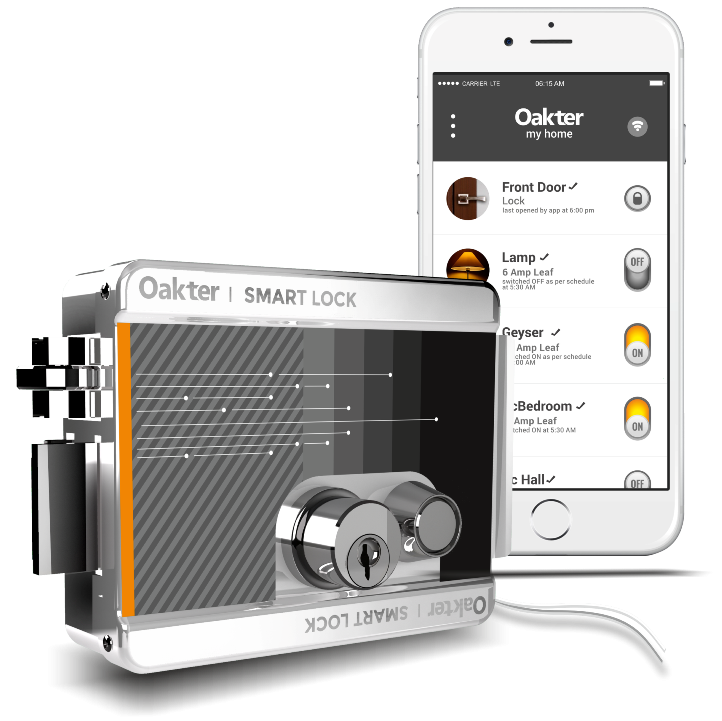 Oakter’s smart kit starts from only 5000 Indian rupees. Plum is another startup which is having a great idea in the root. It has only targeted lights to make it smart. Basically, by installing Plum lighting at your home or office, you can control it through your mobile in various mode. You can schedule the lights to turn on or off and you can change the colors of the lights. Also, through your mobile, you can manage the lighting of your whole house. 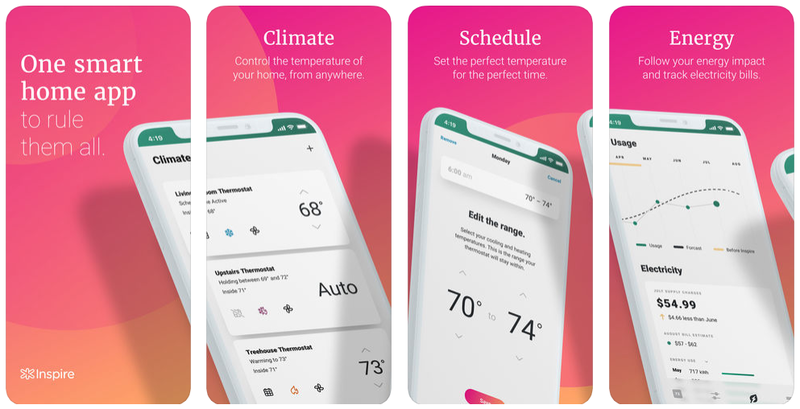 After knowing a few details about three smart home app startups, let’s discuss about DoorPort home security smart home app which has recently made its appearance in one of the articles of the TechCrunch. How developing Smart home App for Home Security like DoorPort can Makes Building’s Front Door Smarter? And What is the Business Model of it? DoorPort is the smart home app which gives the solution of home security. Of course, there are many ways a landlord and residents can use to make sure that an intruder will not enter into the apartment, but it does have much time consuming and not practical practices. Even traditional intercom device has some kind of limitation at one point. DoorPort has analyzed this problem and developed a simple chip which can be easily wired in an existing intercom system. Also, installing process is very simple. There are only two connections. One is for power supply and another is for lock mechanism. Once the chip is installed in the lock mechanism, the Landlord gives access to the residents of the apartment through the admin panel. Residents now only have to install the app DoorPort on their smartphone. Through the app, the resident can lock and unlock the door by doing just a single click. If your friend arrives at your place, he only needs to ping you through the app. It results in a notification on your smartphone. So, from your smartphone, you can buzz him through the door. DoorPort follows the B2C business model, which means transactions happens directly between the company and the customers. DoorPort charges $350 for installation and in order to maintain the hardware of the locking mechanism, it charges $1.50 per apartment unit per month. After reading blog till now, if you have triggered to make a smart home app, then following is the list of things which you need to consider while making your first smart home app. A smart home company like DoorPort has tasted the success because it only aims to provide better home security In an interview, CEO of DoorPort has admitted that his initial plan was to make a smart home app with lots of features like video recording and single day access code. But in the analysis phase, he found out that landlords didn’t want this kind of intense system. The same thing applies in your case. Rather than aiming more than two feature and makes an app with so many features, aims only one or two core feature and makes a straight and simple app. Doing this will attract more users as people will find your app so easy to use. As we discussed, aiming only one or two features of the people will boost the acceptance rate. So, deciding a perfect category of your smart home app is very crucial. These categories include Energy, smart locks, kitchen, home robots, monitoring, Wi-Fi, health, alarm system, Audio, media, and lighting. To decide the perfect category for your smart home app startup, you need to know the purpose of your startup and target audience for whom you are making a smart home app. For Example, if the purpose of your smart home startup is making a kitchen smart and most part of your target audience is women, then you should go for the kitchen category of smart home. Making just a smart home app is just a halfway towards success. You also need hardware which can be installed in the houses. For example, if you want to provide a smart light solution for the smart home, then you need to develop lights which are able to connect with the internet and smartphone. This is possible with IOT (internet of things). So, if you wish to save a lot of money and time then make sure you chose a mobile app development company which has expertise in IOT and mobile app development both. Suppose, a man has installed a smart home kit on Media devices of his house to make sure his child spends a limited amount of time on playing games and watching TV shows and focuses more on the study. Now, if that child gets access to that media smart home kit, then he can easily change the restriction his father has applied on those media devices. If such a thing happens, then it is worthless for that man to spend on smart home kit. Thus, allowing only one or two persons to play with the controls is essential. How building a Smart home app like Doorport can give wings your idea to the next level? People these days are looking for more security in their home. Many apps like DoorPort are becoming huge in just a little time after their launch. Each app is trying to present better than the other. There is a huge scope in the development of such smart home security apps. Our research team at Coruscate has found the deep learning solutions and unlaunched features which you can use while developing your smart home app. We have developed 100+ smart home apps and have entertained more than 1000+ queries. Connect with us for a free consultation through the contact us form or click below to validate your idea for such an app. How we help our client to make a successful smart home app? We are having expertise in IOT (Hardware) and mobile app development (software) both. So you don’t have to visit two different places for two different phases of the smart home app development. Your budget will be satisfied while working with us. Our expert will go beyond your requirements and create a very exclusive app, We are having more than 20000 hours of on-hand smart home app development experience. We follow agile models which means you will get a weekly update and delivery of your smart home app while in the development phase. Click below to get free app quote!! !